The sunday before Memorial day a tornado ripped through the community of Hugo, Minnesota. It has been well covered in the media. What most people don't know is that the storm next visited where I work at the Lee and Rose Warner Nature Center. The photo below shows where we believe was a tornado entered the forest along the edge of the prairie. If you look closely, the enormous oak tree on the right has no top, it has been completely sheared off. We're looking at a one hundred foot around hole in the forest. The trees were toppled in a clockwise direction in the circle. The path of destruction continued in an easterly direction and through the middle of a garlic mustard study area set up by graduate students from the University of Minnesota. Many of the study plots were crushed. Here I am by one of the trees in the study area for size reference. There were actually three swaths of destruction through the center as near as we can tell. Interestingly they all seem to converge at one point down by the lake. That are looks particularly bad. This third photo is from the area where all the paths of destruction converged. 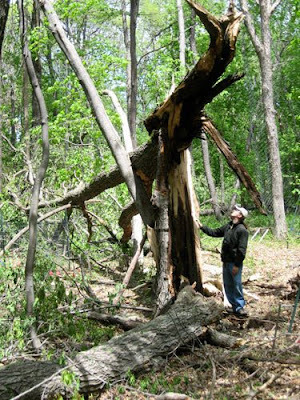 You can see the incredible forces involved as this enormous oak tree was literally twisted apart. In the long run, this sort of thing is totally natural. Large old inflexible trees fall while young trees tat can bend more easily survive. The big canopy hogging trees are felled and new young trees that survived will begin the race to fill the gaps in the canopy. There's a catch though. We've mucked around with the natural order of things. The forest is infested with invasive european buckthorn. It is often kept in check under the canopy of trees deep in the forest but when a large tree falls it creates ideal conditions for the buckthorn and it crowds out native species for the light. The native trees can't compete. It will be interesting to see how the forest copes with this latest hit.